This set of tricky Chemical Process Calculation questions and answers focuses on “Phase diagrms and phase rule-III”. 1. Phase rule is concerned only with the __________ properties of the system. Explanation: Phase rule is concerned only with the Intensive properties of the system. Explanation: Properties that do not depend on the quantity of material present are called intensive properties. 3. _________ variable does depend on how much material you have. Explanation: Extensive variable does depend on how much material you have. Explanation: Gibbs phase rule can be applied to the systems which are in equilibrium. Explanation: Gibbs phase rule: F – C + P = 2. Explanation: F – C + P = 2, for Pure gas, number of phases = 1, and component = 1, then F = 2. 7. A ________ system is one in which no variation of conditions is possible without one phase disappearing. Explanation: A invariant system is one in which no variation of conditions is possible without one phase disappearing. 8. What is the degree of freedom for a mixture of ice and vapour? Explanation: F = 2 – 2 + 1 = 1. 9. What is the degree of freedom for pure liquid Benzene? Explanation: F = 2 – 1 + 1 = 2. 10. The number of independent properties that have to be specified to determine all the intensive properties of each phase of the system of interest is the number of degrees of freedom. Explanation: The number of independent properties that have to be specified to determine all the intensive properties of each phase of the system of interest is the number of degrees of freedom. 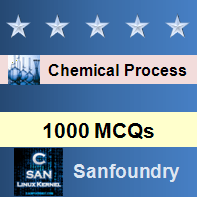 To practice tricky questions and answers on all areas of Chemical Process Calculation, here is complete set of 1000+ Multiple Choice Questions and Answers.